Eve flew off this morning with her dad, leaving the nest empty, she is college bound to Vermont. I'm intending her flying wings will work, judging from the amount of elemental water present as she left for the airport, I'm a little concerned. I remember leaving her crying and screaming bloody murder with her kindergarden teacher when she was a wee one. Of course, eventually she got use to it and found her tribe of friends. If she were an adventurous child I would be feeling a bit better, however, Eve is very sensitive and has never been one to want to venture far from the nest. Her favorite natural perfume is Rosa solid, so I prepared a fresh tin for her compact. I took photos to share here on this post but them realized she took her card reader thus I cannot extract the photos from the card. (duh!) Thus, on the list of things to do today will include going to purchase my own card reader. So....here I am, a bit melancholy today, gazing at a white page in a new chapter of life. 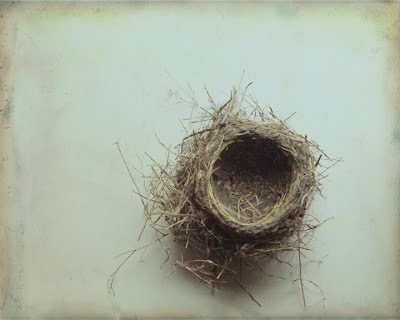 "Empty Nest" Image graciously loaned by Lucy Snowe, check out her gorgeous photography work here. I wish Eve the best -- and you too during this time of transition. Love the look book, really beautiful! Oh Roxana, I am one empathetic Mum! My youngest flies all the way from our home here in Australia to London next week. Bless you and Bless Eve. I hope her transition is gentle and ease-filled, and that she's not too daunted by her new environment.